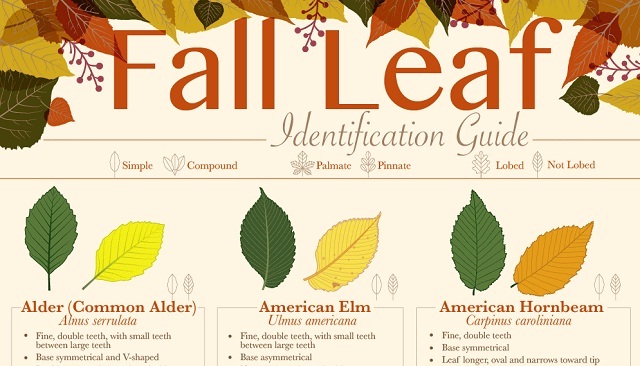 Fall Leaf Identification Guide #infographic ~ Visualistan '+g+"
Fall into fall with this comprehensive leaf identification guide. Scroll along so you can learn more about the forests around you while on your autumnal strolls. Our list of fall leaves can help you identify which leaf goes to which local tree in North America, from the loping leaves of oaks to the simple shapes of elms to spiky, fun designs of maples. Nature has created such beautiful artwork for us; stop and inspect its designs this year! For surprising friends with your nerdy knowledge or just truly enjoying your hike, you can use this guide to learn about ecological diversity while leaf peeping. We’ve pointed out the difference between simple, compound, palmate, pinnate, lobed, and not-lobed leaves. We also added tips for telling similar leaves apart. Colors may range and change, but the shapes tell us a great deal about the tree that it came from. Go outside and enjoy your fall adventures this year with the help of this infographic from MJJSales.com.